You are currently browsing the archive for the Flower Of The Week category. Colours: from green to yellow, bronze to red and pink. This unusual looking plant gets it’s name from the furry paw-shaped flowers it produces. The Latin name anigozanthos is pronounced ANNY-goz-an-thos. 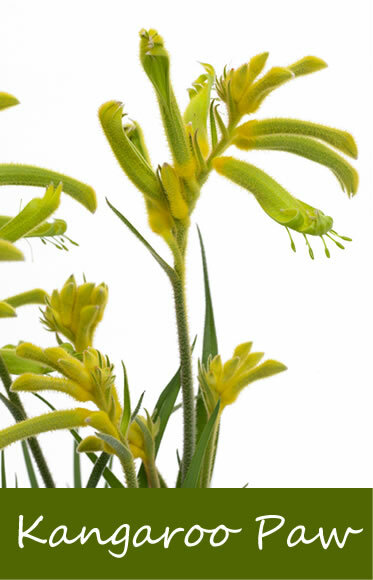 Kangaroo Paws have tall sturdy stems that branch out, the flowers are perched at the top of each branch, each flower tip opens into a tubular flower. The brightly coloured flowers are covered in tiny hairs which give the flowers a velvety feel. They are grown as house plants, but more commonly seen as cut flowers. As a plant they like full sun and well-drained soil, they should be kept inside your house or conservatory, you can put them outside in the summer. 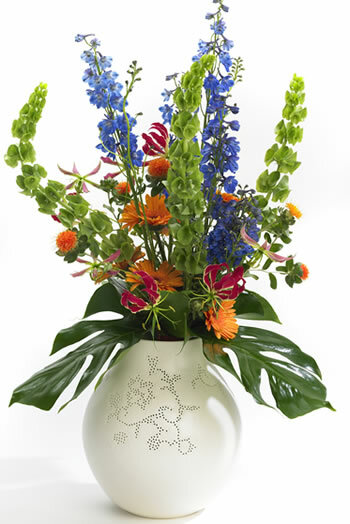 The attractive flowers can last several weeks in a vase if the stem ends are regularly trimmed. 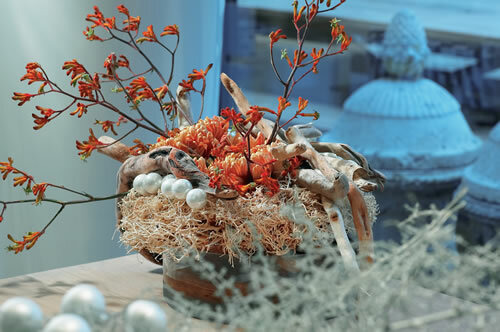 Kangaroo Paw is available in lots of colours, but in particular many autumn shades like burnt oranges, reds and browns. Colours: white to yellow, terracotta, shades of pinks and deep purple. They are usually referred to as calla or arum lilies, arums are usually hardier and larger varieties. The botanical name is pronounced zanter-DEE-sha. They were named zanterdeschia in honour of Giovanni Zantedeschi an Italian botanist. 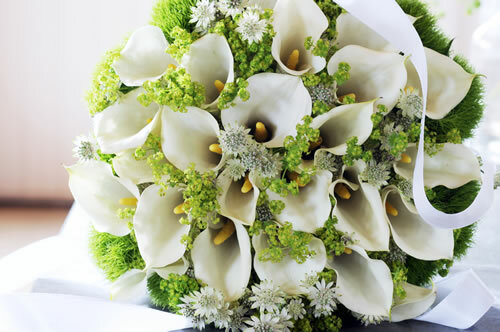 There are eight species including giant white arums and various coloured callas. They have thick fleshy stems and showy flowers, which are popular as cut flowers. They grow naturally in marshy areas, in some countries they have naturalized and are regarded as weeds. 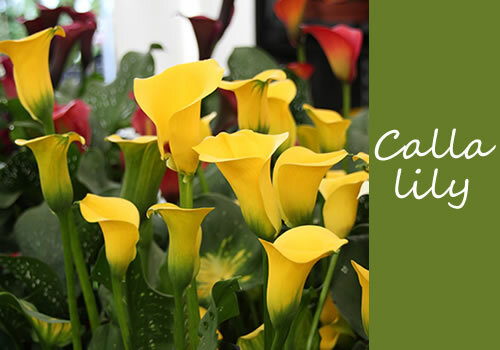 All parts of calla plants are poisonous and should not be consumed. 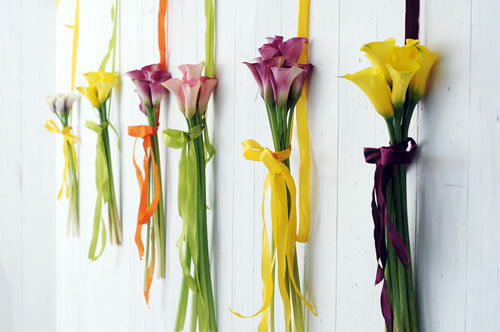 The structural shape of calla lilies makes them very popular as cut flowers and for corporate displays. They are available in many colours and last about 2 weeks. Some varieties like green goddess last up to 4 weeks. 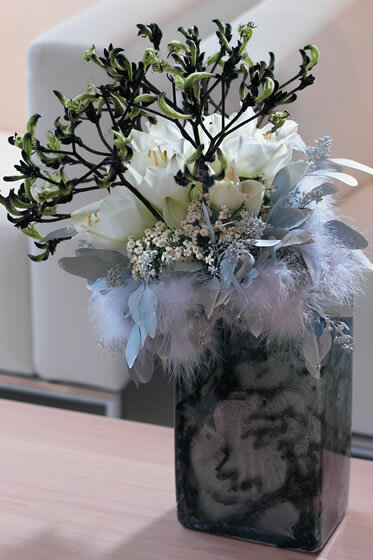 Callas are a luxury flower used in premium bouquets and wedding flowers. Colours: virtually all colour except blue. Pale pastels to vibrant reds and purple, some bi-coloured also. 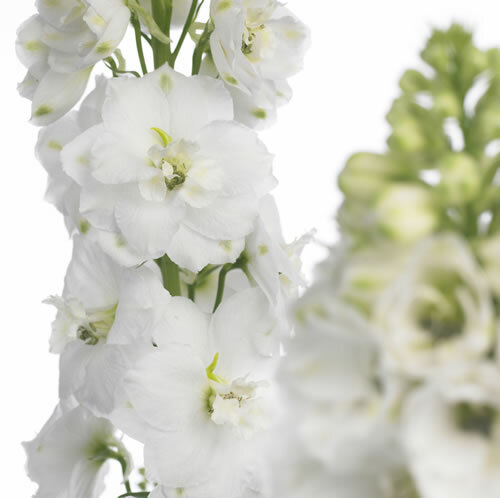 Gladioli get their name from the Latin word Gladius, which means sword, due to their sword shaped leaves. 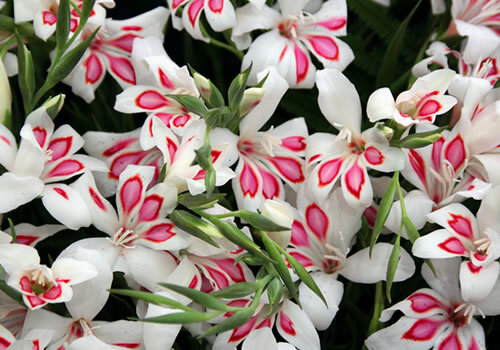 They are bulb flowers that produce a single flower spike and several narrow leaves. There are 260 species of gladioli, nearly all of which are native to Sub-Saharan Africa. In the wild the gladioli vary greatly in size and the number of flowers. The gladioli you see in florist shops today has been hybridised to produce giant ornamental varieties. Smaller varieties like the one pictured above are often referred to as bridal gladi, they are used in wedding flowers as the dainty heads are a perfect size for bridal work. Gladioli last well as cut flowers, they have become trendy again in recent years after suffering from an image problem. Dame Edna was famous for having gladioli and may have contributed their old fashioned image. They come in so many gorgeous colours there is no need for them to look past it. Some of my favourites include a deep purple variety that looks almost velvety black and a bright acid green shade. They are mainly a summer flower available from May to October, though sometimes the season is longer. A few gladioli look good peeking out above other flowers in a mixed bouquet or a full vase of gladioli in a single colour is glorious when open. 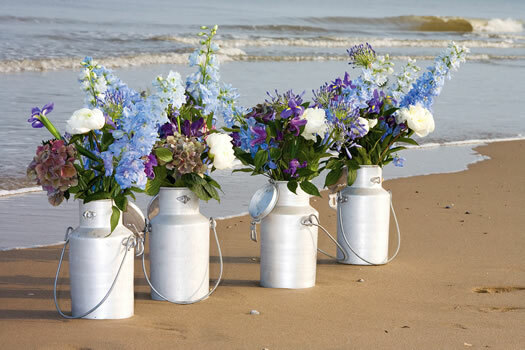 They are usually bought closed or a few bottom flowers open, they should not be bought fully open. 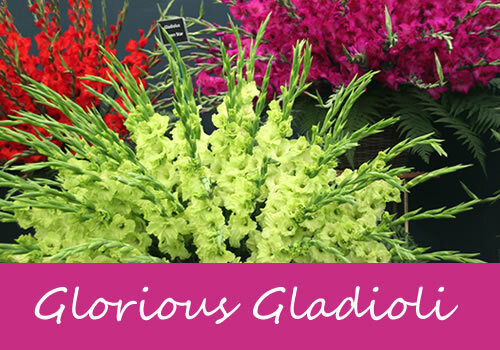 Gladioli are often available as locally grown British flowers in the summer months. To encourage the whole stem to open, the very tips of the flowers (two or three buds) can be gently removed. 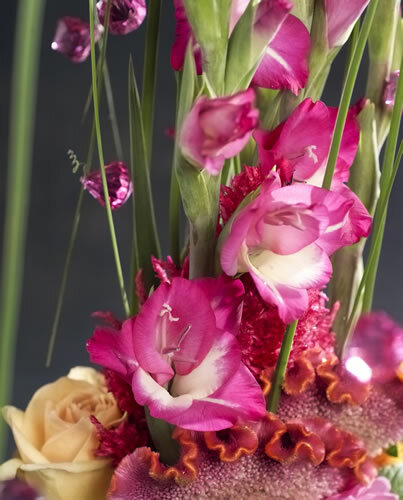 Gladioli are thirsty flowers; make sure they are placed in deep water. 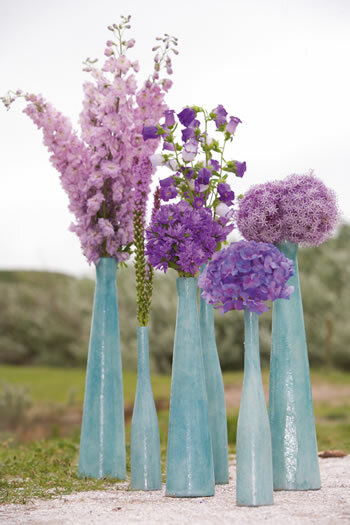 These lovely flowers have long, strong stems with a round cluster of funnel shaped flowers at the top. 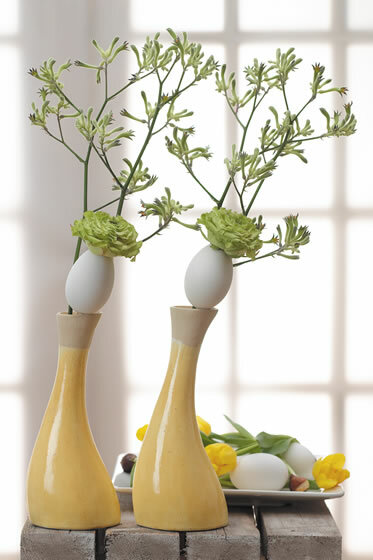 When you buy them as cut flowers, they have no leaves, as the leaves grow at the base of the plant from the roots. Their name comes from the Greek word agape which means love and anthos meaning flower. 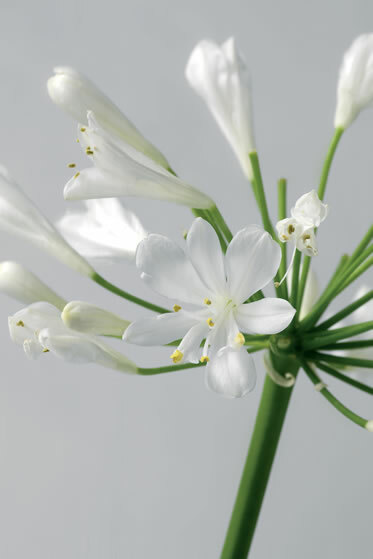 Outside the UK, Agapanthus is known as ‘Lily of the Nile’, although it’s not a lily. They were one of the first plants to come from South Africa. They arrived around 1650 and have now naturalised on the sand dunes in the Isles of Scilly and Torquay. As cut flowers they are mainly available in the summer, but a few varieties are available in spring and winter. They are easy to grow as plants, they like well-drained soil and full sun in the garden. They should be protected from frost with mulch or fleece in the winter as even hardy varieties can suffer from the frost. 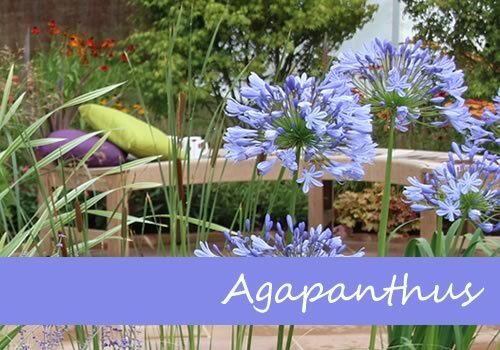 Agapanthus is fashionable as both a cut flower and plants in the garden. 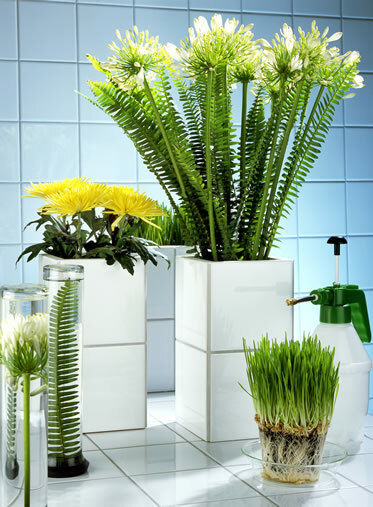 Their strong tall stems are often used in large vases and arrangements. They commonly come in shades of blue from powder blue to a deep indigo; they are rarer in white as a cut flower. They will last up to ten days in a vase. The name is pronounced del-FINNY-um. It comes from the Latin for dolphin ‘delhpis’, referring to the flower’s resemblance to the bottle-like nose of dolphins. Delphinium is part of the buttercup family which contains around 300 species, including anemones, clematis and hellebore. It is rarely referred to as larkspur as there is another closely related plant with similar flowers called larkspur, which has smaller heads and is available in pinks and purples. They are mainly a summer flower, but some varieties are available all year round. They are grown in garden for their lovely tall flower spikes. In the past the flowers were used by Indians to make dyes and paint. The plant is toxic so care should be taken when handling them, wash hands and any tools that have come into contact with them. Delphinium are excellent cut flowers, they look glorious on their own or mixed with other summer flowers like peonies and garden roses. They last up to a week in a vase or arrangement. They are such large striking flowers, they are commonly used in large wedding displays such as pedestal arrangements in church.